[New for Fall 2014] So the fine folks at gelato fiasco have hooked us up with a bunch of free samples. First we covered the potent pumpkin pie flavor, but now it's time to cover something that is.... I think mesmerizing is a good word. Let's check it out. it takes me a bite or two to figure out whats going on, but I like it.... and then I take several more bites and I decide I REALLY life it. Yeah, this one is addicting. The more you eat, the faster you go. If you need something different but still familiar and awesome, this is the way to go. See, any good cookies & cream flavor is chuck full of cookie wafer bits. The wafers need to invade every morsel of ice cream. 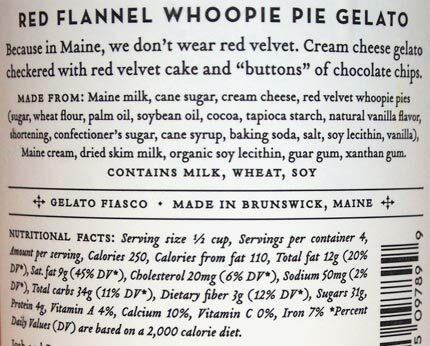 That same strategy has been smartly applied to a cake infused ice cream and oh man oh man do I want to devour this pint. 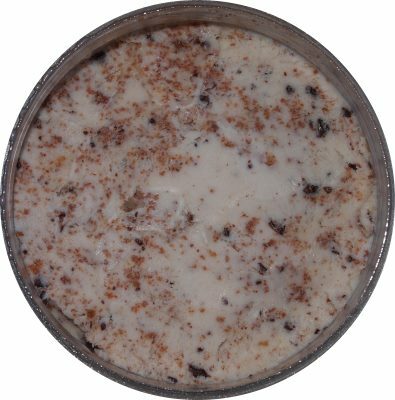 There are just so many bits of cake changing both the texture and flavor of every bit of this ice cream. Even the chocolate chips are well thought out. Rather than huge chunks jarring me from my textural playground, they use these tiny "buttons" that add just bumps of texture change, nothing drastic. Just nice little bits of chocolate keeping things interesting but never distracting. You know, it's funnny how often I wind up talking about flavor last. Well, I like it, it's different. It's cheesy, but not in any kind of offensive way. It's not fake or artificial or overbearing. It's there, but it came to play along, not dominate. Mix in the flavor from the never ending cake bits and you've got a nice overall flavor. Familiar yet different. A frozen treat that's definitely not your typical gelato. Well played Gelato Fiasco, well played indeed. On Second Scoop: Technically the second scoop was about 90 minutes after the first scoop. However, right now it's two days later and I realized this stuff might make for a nice breakfast. Oh how I wish I could figure out what this reminds me of. I love that it's flavorful but not overbearing. I love the chips. I love the gritty cake texture. Ahh, I'm scooping faster and faster again! 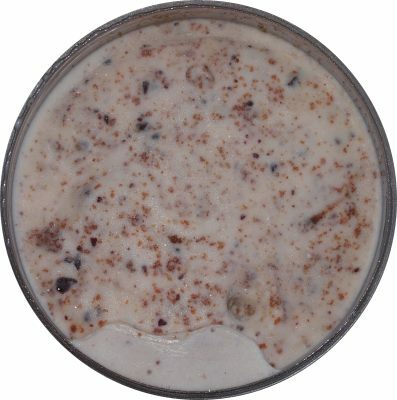 I got it, I think one this reminds me a bit of Talenti's chocolate chip stracciatella, except this one is way more fun. Just wondering why you don't have a problem with gelato the way you do frozen dairy dessert? On Haagen Dazs's gelatos they say "Italian Style Frozen Dessert" and have the same ingredients as frozen dairy desserts. I understand the texture thing but even some ice cream brands out there have a ton of stabilizers and a fluffy texture even though they are called ice cream. Seems like the focus should be on all natural and the ingredients themselves instead of getting hung up on what they call the frozen stuff inside. ummmm.... does it really seem like I'm hung up on the words rather than the actually product? have you ever tried gelato? and now I'm getting frustrated and sarcastic, let's try this again. everything has it's place in this world, ice cream, gelato, froyo, sherbet, sorbet, FDD. yes, I think calling the new H-D stuff as italian style frozen dessert is dumb, but at the same time it doesnt feel like real gelato anyway. That said, its still a quality product. I dont really care what you call it, I care how you make it. Breyers makes stabilized junk to save money then blames the consumers for demanding their "creamier" product. I want quality products like the ones I grew up on. Besides the breyers gelato nonsense, it's rare to find a junk gelato. It's not hard to make a respectable product. It's not hard to make people not regret their purchase. also, when do we not call out the gummy, stabilized filled companies? i bashed edy's for years before they got their act together (still not perfect but it's better). texture is immensely important to me. i dont want airy. i dont want gummy. I want the ice cream I grew up on. Anon, I get hung up on certain frozen dairy desserts due to their texture and all around cheapness in quality for the most part. Focusing on Haagen-Dazs, the reason why they calls their gelato "Italian Style Frozen Dessert" is because by rule they can't call it ice cream and a lot of Americans aren't too familiar with what gelato actually is. The term "gelato" isn't regulated in the US like the term "ice cream" is so it's not like Haagen-Dazs would be able to say "Italian Style Ice Cream". We also have brought up the problems with their texture when they were first released which has been improved this year. You're correct that some ice cream companies do fill their products with stabilizers but those products are still far superior to that of most frozen dairy desserts. Sadly, the focus shouldn't be on all natural but solely on the quality of ingredients being used to produce these produces. Just like gelato, the term "all natural" isn't regulated either. Buzzwords are what get people to buy products without actually looking at what's in them. There's a certain reason why frozen desserts have different names and it all boils down to the FDA regulations. While we're not a fan of frozen dairy desserts most of the time, we don't discriminate when it comes to not liking a product. If an ice cream or gelato has a terrible texture or a cheapness to it, we won't hesitate to point it out. Same goes for products if they're overly prices, cheaply made, so on and so fourth. 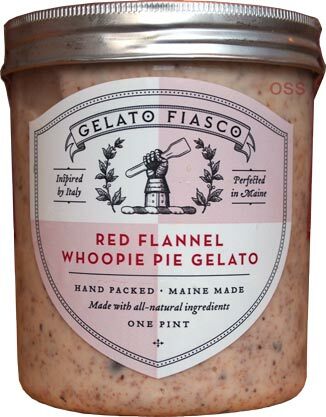 Thankfully there are companies out there like The Gelato Fiasco who take making frozen desserts seriously and treat it with pride and as a craft, not just a way to make money.